The Mystery of the Leaping Fish (1916). In this Sherlock Holmes parody, Douglas Fairbanks as "the world's greatest scientific detective, Coke Ennyday," seeks to uncover the mysterious source of a man's wealth. The treatment of drug addiction and Asians may raise a few contemporary eyebrows, but the resourceful heroine and the hapless police will be familiar tropes to mystery fans. "Sorry, Wrong Number" added to LOC registry. Lucille Fletcher's radio play "Sorry, Wrong Number" has been added to the Library of Congress' National Recording Registry. This 1943 episode of Suspense stars Agnes Moorehead as an invalid who overhears something she shouldn't on the telephone line. There's more amnesia in store in Crossroads, as diplomat William Powell is blackmailed for crimes that occurred before he lost his memory. Hedy Lamarr, Claire Trevor, and Basil Rathbone co-star. 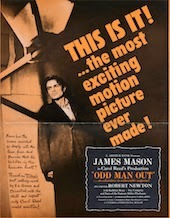 F. L. Green's Odd Man Out (1945) returns. Valancourt Books has reprinted F.L. Green's noir novel Odd Man Out (1945). The 1947 film adaptation was directed by Carol Reed, featuring a screenplay by R.C. Sherriff (Journey's End) and James Mason as a wounded IRA gunman on the run. The radio program University of the Air discusses the case of Rhoda Lavinia Goodell, the first female lawyer in Wisconsin, and the new play based on her struggles to practice law that is on stage in Madison this month, Janesville on March 29, Wausau on April 11, and Superior on May 17. "We know of no woman who has done so much to make woman respected as a legal practitioner"
Conan Doyle, Hammett items go at auction. • 30 letters from Arthur Conan Doyle that pertain to the George Edalji case; related materials have revealed the fabrication of evidence and an attempt to blacken the author's reputation. 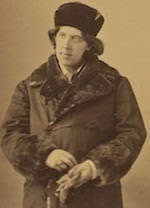 The letters were valued at $30,000–60,000 and were sold for $20,453. Somewhere in the Night (1946). In Somewhere in the Night (with a screenplay cowritten by Joseph Mankiewicz) amnesiac WWII veteran John Hodiak fears that he may have committed murder. Conference "Lippincott's Legacy" (May 2015). This film from Merlin Films shows investigators from New Scotland Yard on the trail of some stolen tea. Further light on Midnight Express. Just added to Harvard's Houghton Library collections are memorabilia and letters from Billy Hayes, coauthor of Midnight Express. Alan Parker's 1978 film earned Oscars for Oliver Stone (for screenplay) and Giorgio Moroder (for score). 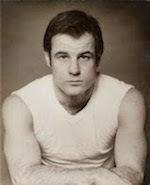 The late Brad Davis played Hayes, a convicted drug smuggler who escaped from a Turkish prison. Some Hayes letters appear in The Midnight Express Letters: From a Turkish Prison 1970–1975. 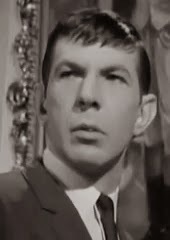 Remembering Leonard Nimoy: "The Project Strigass Affair" (with William Shatner, 1964). Leonard Nimoy passed away at age 83 on February 27. Prior to Star Trek, Nimoy and William Shatner appeared together in The Man from U.N.C.L.E. episode "The Project Strigass Affair." "Intl Exhibition of Sherlock Holmes," Dallas. This blog post from the Dallas Morning News discusses the "International Exhibition of Sherlock Holmes" at the Dallas Perot Museum of Nature and Science, including footage that shows items from the exhibition. The post mentions that Arthur Conan Doyle biographer Daniel Stashower wrote the plot for the case solved by visitors. The exhibition is on view until May 10, 2015.